PDHPE: Skills, Movement, Sport, Personal Development. ethical Hula Hoopin’- Cowgirl Show in town. Heidi Hodeo’s Circus Rodeo follows in the tradition of the early travelling circuses and rodeos, but with an excitingly different spin… HULA HOOPS! 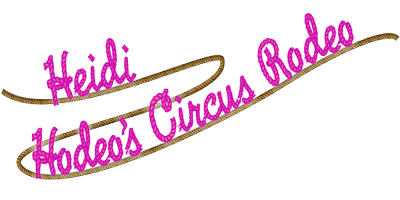 It’s the day of the Annual Circus Rodeo Competition and Heidi is competing in several different segments including, whip cracking, lassoing and hula-hoop spinning. She is out to prove she is the best by spinning her hoops not just around every part of her body, but also around her hat! In order to win the rodeo competition and beat the reigning champion, she will need to ride her pony (a saddle), lasso a small herd of calves (children), catch a prize dairy cow (a wacky costume) and ultimately learn some very valuable life lessons including ‘we all need friends’. For without friends, how can she possibly manage to spin all of her twenty hula hoops at once? With willpower and imagination Heidi overcomes her doubts to win her first big rodeo contest. Loads of audience participation, zany costumes, circus skills, shadow puppets and magic rope, make this a show full of laughs and delights. There are no animals but Heidi makes you believe she is a real cowgirl, as she gets you laughing and calling GIDDY UP, MOO and YAHOO! Heidi (Hoops) Hillier has been a circus performer for many years. She has a repertoire of amazing tricks and can spin up to 20 hula hoops at once! With a BCA Honours in Creative Arts, Heidi has created very stylish costumes, props and set, giving her show a very professional look. Excellent show. An excellent performer! Melanie Lyne. P-6. Wonga Beach State School. QLD. June 2018. This was so engaging - kids absolutely loved it. A fantastic way to celebrate the end of the year. A wonderful performer and performance. Could see it again. S. Tolhurst. K-6. Windang Public School. NSW. Dec 2017. Times: 50 minutes. Set up: 45 to 60 minutes. Pack up: 30 minutes. Requires an indoor performing area 4.5m deep x 7m wide x 3m high.